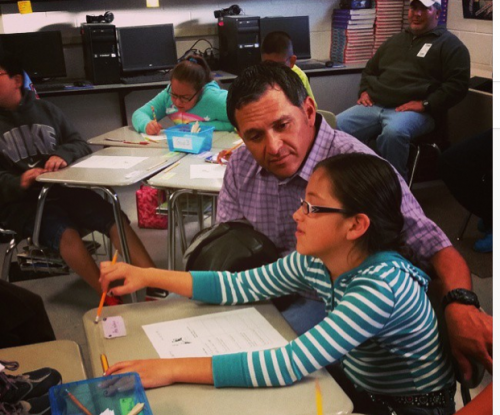 “Bring Your Dad to School Day” at Marfa Public School, October 2014. On Monday, January 12, at Marfa Elementary School, it’s “Dad and Kid Math Night.” It’s a parent-engagement program with a particular focus – on men. Mike Hall, the man behind the program, says that women are traditionally the focus of groups like PTAs (Parent Teacher Associations). But Hall has found the involvement of fathers is a pathway into improving a child’s education. “This is what we do, work with dads and kids in schools,” says Mike Hall, addressing a roomful of fathers on a fall day at the cafeteria of Marfa Elementary. It’s “Bring Your Dad to School Day.” About 110 fathers re-arranged their work schedules this day. The elementary has 230 students. Hall lives near Fort Worth. He’s a former teacher and principal who learned that when dads were more involved in their child’s education, they had better results. He cited a study that showed when dads read to their children, verbal levels rise at a higher rate than when moms read to them. He noticed schools weren’t engaging fathers, so started his organization: Strong Fathers, Strong Families. Hall explains that the changing classroom reflects the changing workplace – the speed of information, new styles of management – but with programs like “Bring Your Dad To School Day” or “Dad and Kid Math Night,” he’s looking for something more immediate than preparing for the future. His focus is on the here and now. It’s easy to point to studies linking behavioral issues to children with few role models outside the school, or no dads in the home. But what Hall’s organization attempts to address is the dad who is under the same roof but just not connected to his child’s schooling.